In the United States, 2016 was the second hottest year on record, replacing 2015, which is now the third hottest. Data source: NOAA National Centers for Environmental Information. Weather data for 2016 has been posted on the Climate at a Glance data portal operated by the National Centers for Environmental Information. 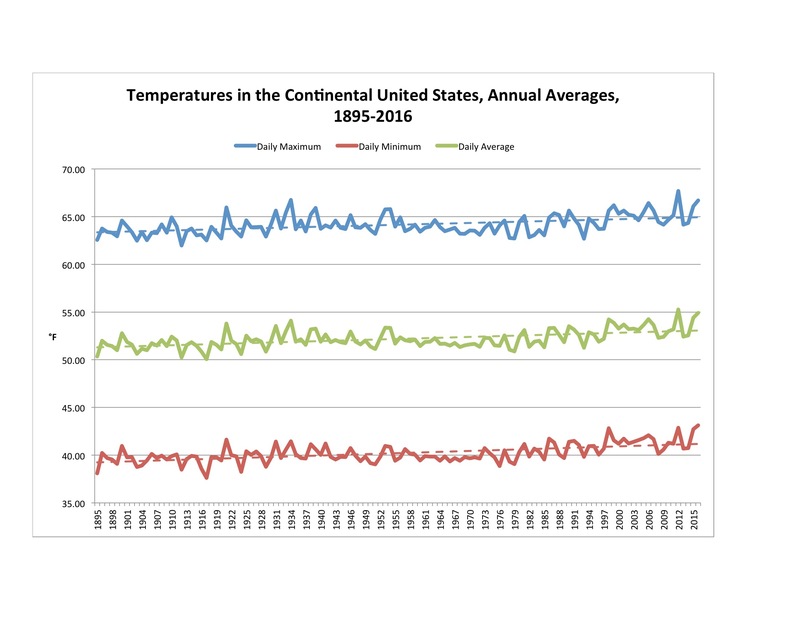 Figure 1 shows average temperature trend for the contiguous 48 states. 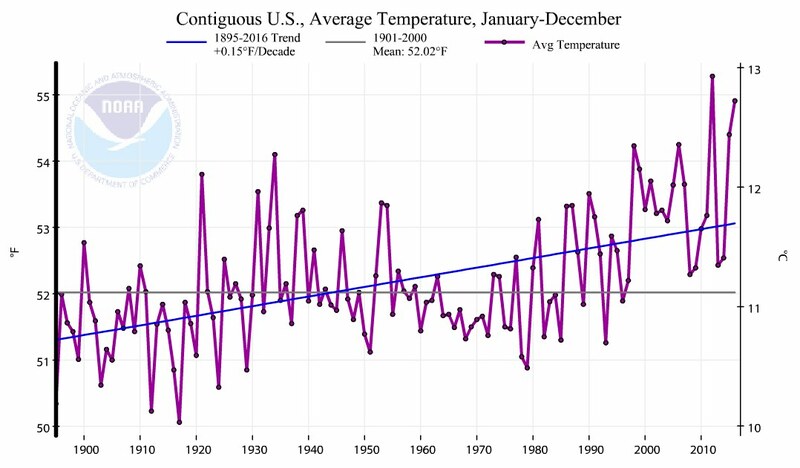 The purple line represents the yearly average, the blue line represents the trend over time, and the black line represents the average temperature over the entire reference period (1901-2000). The average temperature for 2016 was 54.91°F, some 2.89°F above the mean, the second warmest year in the record. The warmest year was 2012 at 55.28°F. The third warmest was 2015 at 54.40°F. There is a lot of variability from year-to-year, but the trend is clearly upward, especially since about 1980. Figure 2 shows the trend in the average daily maximum temperature (red line), the average daily minimum temperature (blue line), and the average daily average temperature (orange line). I have dropped a dashed linear trend line on each. If you look at the trend lines carefully, you can see that, while all three are increasing, the trend for minimum daily temperature is steepest, followed by daily average temperature, with the trend for daily maximum being least steep. Though they are not shown on the chart, the equations for the trend lines confirms the visual impression: the average daily minimum temperature is increasing faster than the daily maximum temperature. This finding is consistent with projections for climate change: as the temperature warms, the atmosphere can hold more humidity. The humidity reduces the amount of cooling that occurs at night. In Missouri, the average temperature was 57.4°F, the fifth highest reading in the record. The highest reading occurred in 2012. 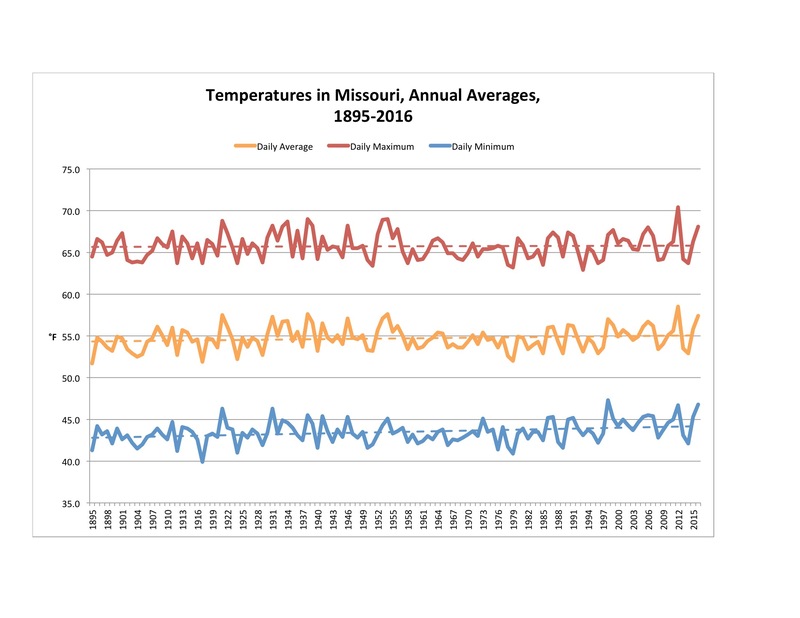 Figure 3 shows the Missouri temperature trends. The red line at the top shows the average daily maximum temperature, the orange line in the middle shows the average daily average temperature, and the blue line at the bottom shows the average daily minimum temperature. The dashed lines show the trends. The trend lines show that the national pattern applies in Missouri: minimum daily temperature is increasing most rapidly, followed by daily average temperature, then daily maximum temperature. The change in Missouri is less than the average nationwide change, and the reason is, again, humidity. Missouri is a humid state, and it takes more energy to change the temperature here than it does in a dry state. Because I have been following the water situation in California, I will note that the average temperature there in 2016 was 60.2°F, the third highest since record keeping began. The highest on record occurred in 2014, and the second highest in 2015. Thus, it has been a really warm 3 years in California. To summarize, 2016 was warmer than average. Across the entire contiguous United States, it was the second warmest year in the record, while in Missouri it was the fifth warmest. I’ll look at precipitation during 2016 in the next post. NOAA National Centers for Environmental information, Climate at a Glance: U.S. Time Series, Average Temperature, published January 2017, retrieved on January 9, 2017 from http://www.ncdc.noaa.gov/cag. By mogreenstats in Climate Change, Weather Patterns on 2017/02/23 .